With effect from the 1 December 2017, Pure is the repository where University researchers are required to deposit their research outputs. In order to comply with the REF 2021 Open Access policy, you must deposit your author accepted manuscript within 3 months of the date of acceptance for all Journal Articles and Conference proceedings. New staff research outputs should be added to Pure, not to Eprints. 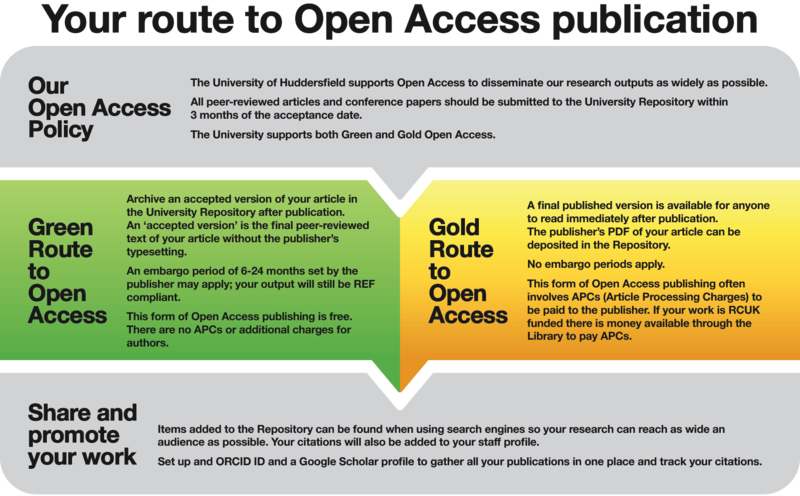 The University Open Access policy is designed to ensure that the University of Huddersfield meets the Open Access requirements of the next Research Excellence Framework (REF). ORCID provides a unique persistent digital identifier for individuals to use with their name as they engage in research, scholarship, and innovation activities. Open Access (OA) refers to material that is free to all readers at the point of use. 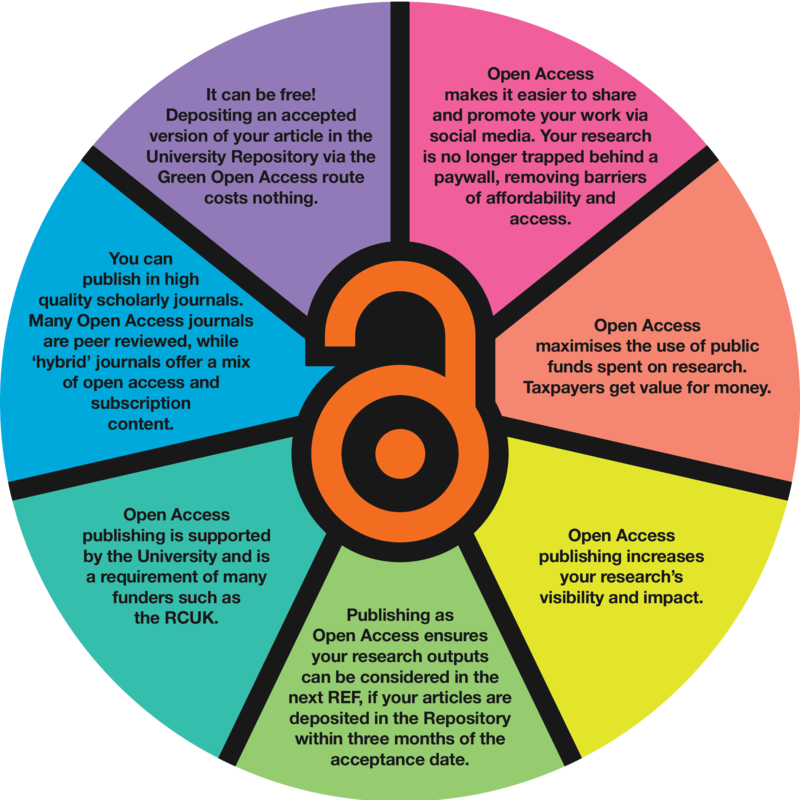 Why should I publish my work as Open Access? What is meant by the Date of Acceptance and Author Accepted Manuscript? The Research England FAQ provides details of the definition of the Author Accepted Version - please refer to Section 4.1. Plan S is an initiative for Open Access publishing that was launched in September 2018. The plan is supported by cOAlition S, an international consortium of research funders. Plan S requires that, from 2020, scientific publications that result from research funded by public grants must be published in compliant Open Access journals or platforms. The opportunity to provide feedback on Plan S closed on February 8 2019. A collection of links, commentary and news items about Plan S is being collated by the Office of Scholarly Communication at the University of Cambridge. Why should I make my research Open Access? Open Access makes your research available to many more people than a subscription-only journal article does. There is evidence that this can lead to an increase in citations of your work. Open Access encourages public engagement with research, which is often paid for out of public money. Your funding body may have a mandate which requires you to make your research available in an Open Access source. Research England and the three other UK HE funding bodies believe that the outputs of research should be as widely accessible as possible. For this reason, a policy has been introduced for open access in relation to REF 2021. The policy states that, to be eligible for submission to the next REF, authors’ final peer-reviewed manuscripts must have been deposited in an institutional repository (at the University of Huddersfield, this is Pure). . This policy applies to research outputs accepted for publication after 1 April 2016. Deposited material should be discoverable, and free to read and download, for anyone with an internet connection.